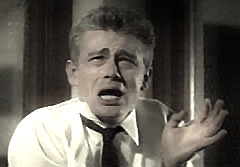 In Nicholas Ray’s 1955 Rebel without a cause1 we follow the protagonist Jim Stark (James Dean) into delinquency. In this film, Nicholas Ray and the scriptwriter, Stewart Stern, set out to portray the life of the contemporary American teenager. The story is organized around Jim, recently arrived with his parents in a Los Angeles suburb in the hope that their son will conform and lose his rebellious streak and take ‘a right step in the right direction’. But Jim manages to get into trouble quickly. After being challenged by Buzz, the popular Kid in town, to a ‘chickie run’ (two drivers of stolen vehicles drive toward a cliff; the one that jumps out first is considered to be a chicken i.e., a coward and not a man), Jim finds himself surviving, while Buzz plunges off the cliff and dies. Against his parents’ advice, Jim goes to the police to report the event, but, not finding Ray, the sympathetic officer he knows, he leaves. At the same time, Buzz’s friends fear that Jim has reported the event to the police and pursue him. Jim hides in a deserted mansion with Judy (Natalie Wood) –– who has been Buzz’s girl, but couples with Jim after the chickie run –– and Plato (Sal Mineo), a younger marginalized teen. Running toward the safe haven turns out badly. When Buzz’s friends and the police discover the three, Plato shoots and injures one of Buzz’s friends before running to the planetarium to hide, fearing that the police will shoot him. Jim and Judy run after him, and the police surround the planetarium. Jim convinces Plato to walk out and also negotiates with the police for a peaceful ‘arrest’ of his friend Plato. Despite this, Plato panics and, holding his bulletless gun, runs out and is shot dead by the police. The film ends with Jim and his parents mourning this loss and reconciling their differences. At the time of the making of the film, the US saw a rise in youth gangs and discontent. Nicholas Ray, influenced by Albert Camus’ The Rebel (2001) and wanting to capture the psyche of youth discontent in the US, along with Stewart Stern, the scriptwriter, provide us with a portrayal of rebellion that goes beyond the usual criminological depictions of the kids that represented delinquency: as either a response to a system that could not provide them with material recognition (Shaw and McKay, 1941) or as a reaction against status formation that results in the formation of youth gangs (Cohen, 1955). The filmmaker and scriptwriter provide us with a different gateway: Jim Stark’s actions are an ineloquent perhaps and counter-normative attempt to project to his surroundings, family, friends, the State (represented by the police and the school) his own desires and understanding of how he wants his world to be shaped. It is a demand for youth citizenship to be recognized by prevailing social and political structures. So why does this film keep coming back to me? As an example, is it somehow incompatible with our contemporary conditions? As William Wall argues, we are living in neoliberal times, in which structural inequalities are at their highest since the 19th Century, and we should begin to articulate these riots in this context; as Zygmunt Bauman pointed out ‘these are riots of defective and disqualified consumers’; or as Laurie Penny aptly argues, they are about grasping some power or rebalancing the balance of power. These are all thoughtful reflections to articulate the riots. They are all commendable, as are the videos of the Hackney Afro-Caribbean woman and the Darcus Howe interview. I am certain that, in times of discontent, we all gather our knowledge and experience to address the present, and expertise is not necessarily a required skill. We have all heard strangers on the tube or the bus opening up to each other, trying to share their experiences and understanding of these days. All of these could be an attempt to grasp our reality, to share our vulnerability, concerns and hope – an attempt to address and share the present. I haven’t got the experience and historical knowledge of the UK that Howe has or, Penny’s on the ground journalistic facticity, or Bauman’s theoretical knowledge, but I have a moving image playing on my mind and the interview with that woman from Ealing given to the Sky reporter yesterday morning to go by. Let’s see what I can make of them. Let’s just turn to the woman from Ealing first. I read this article and found it very interesting, thought it might be something for you. The article is called Riots and Ineloquence and is located at http://criticallegalthinking.com/2011/08/11/riots-and-ineloquence/. You don’t entertain a 3rd scenario, that they decided to withdraw and leave her in peace? An excellent piece of writing! I started reading this and I just love it!